The California Least Tern currently nests each Spring and Summer on Venice Beach within a fenced area. The sandy beaches are flattened out with bulldozers of the City and County each week in order to give us a false impression of what a beach is. A natural beach forms into sand dunes. These sand dunes form small hills and neat native plants grow on them. The City however, destroys these neat native plants and the neat dune terrain associated with them. In order to view this neat sand dune terrain with its neat native plants and the unique California Least Tern, you must visit a small area that has a fence around it. The Preserve is in the shape of a rectangle that is 180 yard long and 125 yards wide. A fence surrounds the preserve that is from 5 to 8 feet high depending on the amount of sand that the wind has piled up against the fence. There is a effort to maintain a "sand" mote depression area around the fence. The fence was built about 10 years ago by the Pilgrim Fence Company under a contract with the California Department of Fish and Game. The fence is actually three fences connected together. The chain-link fence portion is about 5 feet high, on average. A Chicken-wire type fence extends 3 feet above the Chain-link Fence with a bend outward resembling a prison compound fence. The third fence is also made of chicken-wire and extends about 2 feet up from the ground and is attached to the chain-link fence. The purpose of this small-mesh fence at the ground level is to prevent Rats fromt the Condominium and Yacht Harbor rocks from entering the Preserve to eat the baby Tern. The top part of the fence is to keep people and cats out of the Preserve. The Chain-Link Fence prevents beach visitors keeps visitors from stepping on the eggs of the Lest Tern, but also keeps the City Bulldozers from smoothing out this portion of the sandy beach. This native plant community is simple in consisting of only five species with abundant open space of no plants where only sand occurs. This habitat is even more endangered that Wetlands habitat in Los Angeles County and the City of Los Angeles. Several times a year, the Beach Maintenace personnel pull out all the plants that try to grow outside the fence, for no reason, other than bureaucratic busy work-mismanagement. This vegetation forms a vital part of the success of the nesting of the California Least Tern. If the fence were larger, more Least Tern would nest here, and quite additionally, the endangered Snowy Plover would join the endangered Least Tern in nesting there. Pacific Ocean is 94 yards south of the Preserve. Bathrooms are 40 yards east of the Preserve. Venice Condominiums are 88 yards north of the Preserve. Venice Condominium Dogwalk is 85 yards north of the Preserve. Yacht Harbor Walkway is 132 yards east of Preserve. Life Guard Stand is 80 yards west of the Preserve. Sand Drift Fence is 115 yards east of the Preserve. Volleyball Area is 25 yards north of the Preserve. Ballona Lagoon is 203 yards north of the Preserve. "CALIFORNIA LEAST TERN. quote forthcoming by Roy". This quote by Joseph Grinnell was from his 52 page monograph entitled: BIRDS OF THE PACIFIC SLOPE OF LOS ANGELES COUNTY, published by the PASADENA ACADEMY OF SCIENCES. At the time of his writing, the Los Angeles River sometimes flowed to the sea at Ballona instead of Long Beach. Joseph Grinnell, in 1898 was an instructor at the Throop Institute in Padasdena. Joseph Grinnell went on to get a PHD in Biology from Stanford University, and then become the illustrious and famous professor and director of the Museum of Vertebrate Zoology at the University of California at Berkeley. Joseph Grinnell was also a member of the newly founded Sierra Club and wrote articles for the Sierra Magazine. At the time that Joseph Grinnell wrote his Least Tern quote, the Sierra Club was six years old. This quote by George Willett was taken from his monograph entitled: BIRDS OF THE PACIFIC SLOPE OF SOUTHERN CALIFORNIA in PACIFIC COAST AVIFAUNA, number 7, Cooper Ornithological Club, Hollywood, California. George Willett was a scientist at the Los Angeles County Museum of Natural History. William Dawson was very profound in his closing paragraph, written 75 years ago. His quote could not fit better as if it was written today in regard to the Ballona Wetland and the Playa Capital/Dreamworks real estate developers.This quote by William Dawson was taken from his four volume 2,500 page tome entitled: BIRDS OF CALIFORNIA. William Dawson was a minister that lived in Santa Barbara but traveled widely in California in search of birds, their nests, and their songs. This quote by George Willett was taken from his monograph entitled: BIRDS OF THE PACIFIC SLOPE OF SOUTHERN CALIFORNIA in PACIFIC COAST AVIFAUNA, number 7, Cooper Ornithological Club, Hollywood, California. George Willett was a scientist at the Los Angeles County Museum of Natural History. This quote by George Willett is very telling. Of course we all know that real-estate developers love to drain marshes of their lifeblood, i.e. water. This quote by Jack Von Bloeker was taken from his comprehensive report entitled: Birds of the El Segundo Dunes and Playa del Rey in the Bulletin of the Southern California Academy of Sciences, Los Angeles California. The beauty of Jack Von Bloeker written word is that we can cleary document that they were a nesting bird and quite common at Ballona up till 1943, during World War II. This quote by Kimball Garrett and Jon Dunn was taken from their comprehensive book entitled: Birds of Southern California, Status and Distribution, Los Angeles Audubon Society, Los Angeles California. You should note that the abbreviations are their own code words for counties. As you read that account, you should have noted SD, VEN, SLO, SBA, and ORA. These are the abbreviations of all the counties from central California to the Mexican border, but excluding Los Angeles County. It is painfully obvious that every coastal county of southern California has managed to keep the Clapper Rail from going extinct, except, you guessed it, Los Angeles County. Shame on Los Angeles County and by association Los Angeles City. The blame falls on the current mayor Richard Riorden, Supervisor Don Knabe, and councilwoman Ruth Galanter, for refusing to open the "tidal flap gates" on Ballona Creek. The irony of the writing of Kimball Garrett and John Dunn is quite interesting. For example, the book was published by Los Angeles Audubon Society, yet the entire text shows us that Clapper Rail do not occur in Los Angeles anymore. Secondly, Kimball Garret, a foremost birder of Los Angeles, is also the Ornithology curator of the Los Angeles County Museum of Natural History. His salary is paid by the County of Los Angeles and no Clapper Rails are in Los Angeles County. Furthermore, the Los Angeles County Public Works is primarily responsible for removing the Clapper Rail from Los Angeles County. The County Public Works Agency is also preventing Clapper Rail from re-establishing in the Ballona Wetland by not letting tidal flow return through the County "flap gates" on Ballona Creek. The County continues to dry out the wetlands, cooperating with Playa Capital/Dreamworks. If tidal flow were resored "now," right now, the wetlands of Salicornia (Pickleplant) would expand to Lincoln Boulevard immediately. And it is certain that the Clapper Rail would return. Of course, as an endangered species, the Rail would stop the development of Playa Capital/Dreamworks. So it is my belief that Los Angeles County Department of Public Works is in a conspiracy with the private developer called Playa Capital/Dreamworks. The same Los Angeles County pays Kimball Garrett salary who knows about the Clapper Rail but also pays the salarly of the Director of Los Angeles County Public Works. Lastly, Garrett and Dunn tell us in their quote, that coastal movement of Clapper Rails occurs. So if we created better habitat through restoration of tidal flow into Ballona, Clapper Rails from Orange County would fly back into Ballona and establish a resident population again. It would also be possible to bring young Clapper Rail from Orange County back to Los Angeles County. However, the developers of Playa Capital and Steven Spielberg of Dreamworks would be opposed to this, at least until their massive development would be completed. However, once completed there would no longer be any chance of establishing a population as the wetlands would be too small. Movie studios, homes, businesses roads, parking lots, and other supporting developments would have usurped any Clapper Rail potential at a viable population. The remaining wetlands would be too small to have a viable population of Clapper Rail. 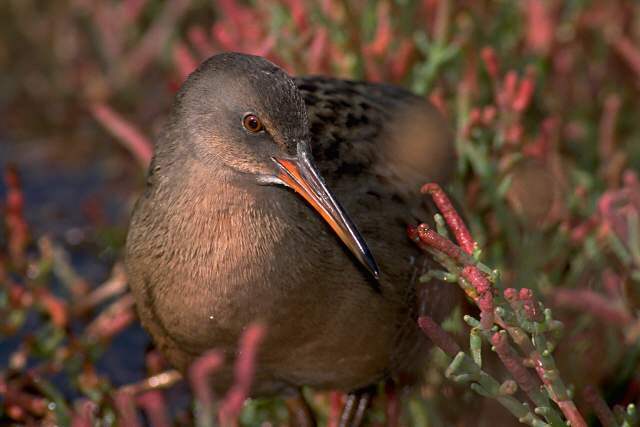 "Upper Newport Bay and Seal Beach National Wildlife Refuge support the last major populations of the endangered "Light Footed" Clapper Rail (R.l. levipes), which Bangs (1899) originally described from Upper Newport Bay. Due to predation by the non-native Red Fox (Vulpes vulpes), high tide counts at SBNWR dropped to a low of two individuals in 1985, prompting the U.S. Fish and Wildlife Service to step up resource management efforts there, including provision of nesting platforms and Red Fox control (Zembal 1993). From 1985 to 1993, the total number of pairs in the county increased from 100 to 207 (Gallagher 1993). Five SDNHM specimens were taken 20 April 1931 at "Balboa Lagoon" (Balboa Island/Lower Newport Bay, where tidal wetlands once existed). S&H (1979) considered this a "fairly common resident" at Bolsa Chica, but only small numbers have been observed there in recent years (high count of three on 20 August 1994). The U.S. Fish and Wildlife Service intends to eventually re-establish Clapper Rail at Bolsa Chica and possibly other local coastal estuaries. This quote by Robert Hamilton and Douglas Willick was taken from their comprehensive book entitled: Birds of Orange County: Status and Distribution, published by Sea and Sage Press of the Sea and Sage Audubon Society. Their book is 150 pages. I hope all of you, readers of this web site, agree that Ballona Wetlands is one of those coastal estuaries that the U.S. Fish and Wildlife Service should select for reintroducing Clapper Rail. If you do, write, call, email, or fax the U.S. Fish and Wildlife Service to begin immediately in tranlocating several pair of Clapper Rail to Ballona Wetlands. You might suggest that you want them to be in the area of the proposed development, in order to stope the development by having another endangered species in that area. I will continue to add new quotes on the Clapper Rail in the near future. Come back and visit the web site again to read more. A FINAL NOTE: DID YOU KNOW? 1. Oil wells are still in the Ballona Wetlands. This activity will lead to pollution and land subsidence. This is bad news for future Clapper Rails. 2. Real-estate developers are still draining the Ballona Wetlands, its bad news for any future Clapper Rails. 3. Biologists could add Clapper Rails to Ballona by taking a few young Clappers from other wetlands, but the real-estate developers are against bringing the Clapper Rail back to the Ballona Wetlands, for obvious reasons. 4. Biologists could also transplant the Cordgrass (Spartina) back to Ballona as it was extirpated about the same time as the Clapper Rail was extirpated from the Ballona Wetalnds.